Here at the Museum of SuperNatural History, we’re always pleased to see when monsters and mythic beasts cross-over into the main stream media and get treated with the respect and reverence befitting these cryptozoological wonders. 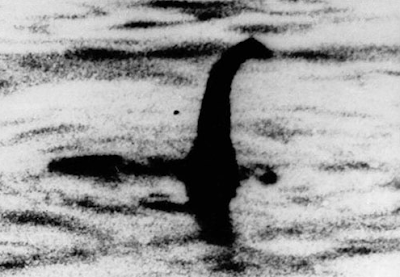 The sea-monster worthy story was replete with an appearance by the well-respected MIT professor Robert Rines, who first encountered ’Nessie during a Scottish Tea Party back in 1972. Rines has doggedly returned to the scene of the sighting every year for the last 37 years, intent on capturing physical and/or photographic evidence Loch’s legendary denizen. Rines is convinced that whatever is in the Loch “...is probably a progenitor of something that should have been dead 65 million years ago.” For those who would pooh-pooh the professors prehistoric premise, we would just like to remind them of the Coelacanth - dubbed “the living fossil” - this extraordinary creature was believed to have gone extinct at the time of the dinosaur, until a living specimen was inexplicably rediscovered in 1938.